In late August a new Steve Hackett album was released in Japan, and hardly anybody has heard about it before hand. 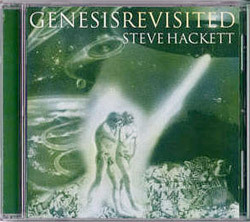 Genesis Revisited follows the trend of the Genesis tribute albums that have come out last year and the first boxset [Archive 1967-1975] that is to come out soon: The album consists of eight remakes of Genesis songs from Steve’s time in the band, the completed version of a hitherto unreleased song Peter Gabriel initiated in 1973 and two of Steve’s own instrumentals. In a somewhat exhausting prologue Steve explains that he had returned to the “strange yet beautiful planet called Genesis” with a couple of friends from the genre of “permissive music” (which term he prefers to “progressive music”) and the Royal Philharmonic Orchestra. He touches on the problem the Genesis line-up encountered in their songwriting back then and thanks his fans for their continuing support. According to what he said in an interview this project was a healing return to the past; apparently it was triggered by the doubts a fan in Palermo had whether Steve would sign the Genesis record he had brought. Steve explains that attempted to develop the sketches from back then into complete paintings by adding colours and highlighting details through the use of his grown experience, modern technology and a bigger team. Since Steve admits to reworking the old compositions under completely different conditions, one cannot, indeed, must not see this album as a kind of reckoning with the band, a smart-alec product of an egotist or something similar. Here is a brief list of interesting details from the eleven pieces: The clear sound is the first thing you will notice about the opening song, Watcher Of The Skies (of course!). "Tony's portentous introduction" (as Steve puts it in the booklet is ruled by violins and still has the desired effect in 1996 – less threatening than it used to be, but gentler instead and very secretive. Instead of the hi-hat a computer comes in with "Phil’s inventive morse code rhythm" (I think it spells the word “heeeeiss”). John Wetton’s vocals are a bit more conventional than Peter’s, and neither Bill Bruford’s whipping drums nor Julian Colbeck’s quietly grandiose foundation for the verse can complete compensate the odd flaw in the arrangement of the original organ part. The final chord, however, is even more bombastic than you would ever have dreamt – listen for yourselves! The precise bass work comes from Tony Levin. The version of Your Own Special Way, “one of Mike’s most beautiful songs” (arranged by Aron Friedman), removes two flaws from the original: The incompatible time signatures in verse and chorus are replaced with a 4/4 throughout, and the instrumental middle eight with a virtuoso e-guitar solo. Paul Carrack was a superb choice for a singer, his voice complements the wonderful arrangement. Incidentally, Richard Macphail sings backing vocals here. Dance On A Volcano proper is preceded by a brief musical sketch of the “volcano landscape”. When we “glimpse into the crater”, as it were, the famous guitar riff comes in. Steve sing-speaks with an electronically lowered voice. Chester Thompson’s drumming and Alphonso Johnson’s bass work are not as overwhelming as Steve thinks. Dance… evolves into a musical sketch with low notes and heavy rhythm that were inspired by the big Egyptian pyramids. The piece is therefore called Valley Of The Kings, and it has Hackett’s old mate Nick Magnus in it. Déjà Vu is the Gabriel/Hackett piece we mentioned before. It is sung by Paul Carrack again; the accomplished arrangement make it seem like a chorale, and it involves a choir, too. The instrumental in the middle shows Steve sailing through different keys. The listener is then refreshed by Riding The Colossus – with this song Depth Charge, a piece that allegedly dates back to 1962 and was released on the live album Time Lapse, has found its way into the studio, albeit with a different second interlude. The Colossus is a wooden rollercoaster ride in California, and that’s why you can occasionally hear rollercoastersounds. For Absent Friends was arranged for Colin Blunstone and orchestra only as a slow waltz (conducted and arranged, as all orchestra pieces on the album, by Matt Dunkley). It seems a bit as if Blunstone did not feel quite at home with the rhythm. Steve considers the tale of the first hermaphrodite in The Fountain Of Salmacis a mini-opera, and he adds the odd passage and musical figure. Though these rather dissolve the coherence of the original they provide many a fine moment along with the flute played by Steve’s brother John. Steve sings himself. Waiting Room Only, like The Waiting Room, is an attempt to journey through various moods. The piece does not only involve instruments but also many other recordings from a railway station, a scary/funny theatre and a fun fair. After three and a half minutes a rhythm begins that rules over the rest of the piece. I Know What I Like moves far into the farcical. It has a swing rhythm, Mr. Farmer is given a deep voice, and a jam is attached to the song proper (as in the live versions) before the final repetition of the chorus in which you can also spot Antonin Dvorak’s Humoresque and various musicians are introduced with their instruments (e.g. “toy piano”) … very peculiar. The best is saved for last: Steve describes Firth Of Fifth as “one of Tony’s finest, in my humble opinion” – and it is a particularly precious gem on this album, too. The former piano intro is performed on glockenspiel and orchestra while a full organ sound supports John Wetton’s vocals. Steve plays the flute part on his “little orchestra”, the six-string acoustic guitar before a hectic new motive is briefly introduced and taken up by the orchestra and other instruments. Calmness returns after a beautiful transition into Steve’s big (though not too long) solo on the electric guitar. We would also like to mention how the orchestra fades in quietly after the piano outro with a piece I cannot place – a fantastic moment! Both The Lamb Lies Down On Broadway and …In That Quiet Earth have allegedly been rehearsed but were left off the album. Rumour has it that Steve is currently working with Tony Banks on a remake of Los Endos as a bonus track for the U.S. version of Genesis Revisited. The cover is a new painting by Kim Poor that illustrates the Creation. Apart from many celestial bodies, some UFO-like objects and a couple of animals the two-colour cover shows Adam and Eva freshly expelled from Paradise. The final evaluation of Steve’s revisit, he concludes, "dear listener, lies with you". Remaster CD from 2007 with the new Stereo-Mix.